It’s no secret the healthcare industry is facing big changes. And it’s not solely related to the uncertain future of the Affordable Care Act and the ongoing struggle for health care reform. 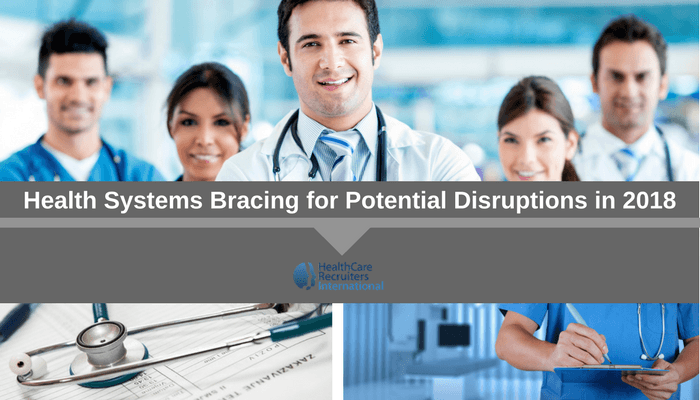 While the ACA and health care reform are certainly hot-button items, health systems are facing some other potentially dangerous disruptions in 2018—ones that may affect the industry with both short and long-term consequences. The reality that is no one really knows what to expect, or what the impact will be as 2018 moves forward. But there will be changes, and chances are they will again have an impact on the bottom line that is yet to be seen. Another potential disruption affecting healthcare this year will be a shift in where patients receive care. It started in August 2017 when Anthem announced it would stop paying for outpatient CT scans and MRIs at hospitals, instead directing patients to outpatient facilities. This is a plus for patients—many found this shift to be more convenient and less time consuming according to HealthCare Dive. But, again, it took a big chunk out of hospital bottom lines. And as more payers are anticipated to move towards this trend in 2018 and beyond, the shift will only continue to impact hospital systems. Additionally, look for more patients to rely on home-based health care services and other outpatient settings—further impacting hospital bottom lines. Protenus, a company that uses artificial intelligence to help healthcare organizations protect patient privacy and secure health data, teamed with DataBreaches.net to create the 2017 Beach Barometer Report. The report indicates that in 2017, 5.6MM patient records were breached—pointing to the struggle for patient and healthcare information privacy. The biggest potential problems were data threat attacks, but additional threats also plagued healthcare networks. While data privacy attacks are serious, a greater concern heading into 2018, as outlined by science and tech news web site phys.org, revolves around cyber-criminals using these attacks to gain access to an organization’s clinical, administrative and financial systems, as well as using a malware attack to connect to medical devices, gaining access beyond patient control. As the 2017 Beach Barometer Report pointed out “Hacking and ransomware attacks, as well as malicious insiders, continue to jeopardize the security of protected health information (PHI). One area of opportunity is in healthcare employment. According to the Bureau of Labor Statistics, healthcare jobs are expected to grow 18% from 2016 to 2026, adding about 2.3 million jobs to the economy. The challenges however, are that where these employers will work, and the specific role they have within an organization, is anticipated to change quickly. This is due in part to the above issues related to healthcare reform, changes in patient care moving from hospitals to outpatient and home settings, and the impact cybersecurity has on hospital systems—and cost containments, now and in the future. What does this all add up to? Another year of uncertainty and another year of potentially devastating health care disruption in 2018. With the continued obstacles healthcare organizations are likely to face, it’s more important than ever to make sure you have the right team of employees who are up for the challenges the future will bring. There’s no way to predict what will happen next, but staying abreast of changes in the industry and having the right people on your side will help better prepare you for difficult times.